Kirk Bell October 11, 2016 Comment Now! Ford couldn't have released the Focus RS at a better time. The Mitsubishi Evo is officially dead, and the Subaru WRX STI is getting long in the tooth. The most recent generation of the STI is only offered as a sedan, and an Evo hatchback was never offered in the U.S. While other automakers are giving up on hot hatches, Ford has just released the hottest of the hatches. The Focus RS makes more power than any hot hatch ever released, including its only current direct competitor, the 292-horsepower Volkswagen Golf R. It also uses some impressive hardware, highlighted by an advanced all-wheel-drive system, 23 pounds of turbo boost, adjustable dampers, and four mode settings that include a Drift mode. Still, this generation of Focus was released for the 2011 model year, and that could mean that Ford is just putting lipstick on a pig. 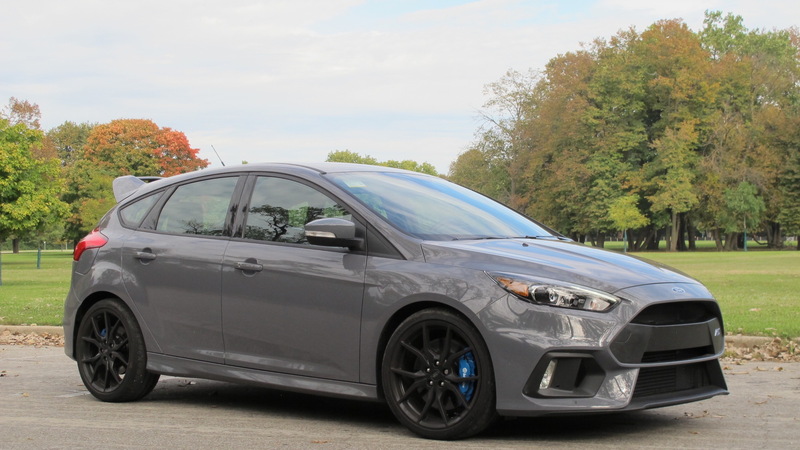 I spent this past week in a Focus RS to find out if it can meet or exceed the expectations of buyers who have come to love the Evo, STI, and Golf R.
The car I drove was a 2016 model with the $2,785 RS2 package that includes an 8-way power driver's seat, leather upholstery with synthetic suede inserts, heated front seats and steering wheel, and navigation. 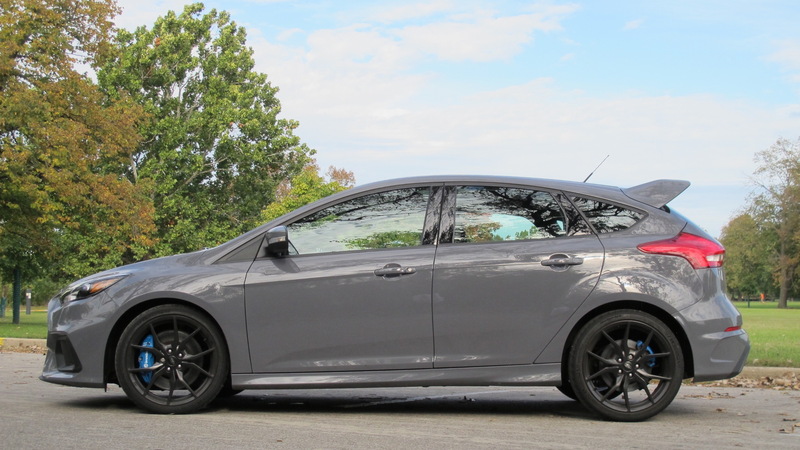 It also had the best go-fast parts, a set of Michelin Sport Cup 2 tires on forged 19-inch wheels for $1,990. Those options, plus the $35,900 starting price and $875 destination charge brought the total to $41,550. My first impressions of the Focus RS weren't all that positive. I took one look at that interior and thought, "Boy, that looks old." That's because it is old. The basic design is the same as it's been since 2011, but Ford has added thickly bolstered Recaro sport seats, a flat-bottom steering wheel, blue accent stitching, metal pedals, an additional gauge set on top of the dash, and a spate of RS logos. It may be old, but the interior is functional. Those sport seats have enough adjustments and range of motion to tailor a comfortable driving position for most adults, and their bolstering keeps front seat occupants nice and snug when the road turns twisty. The extra gauges are a welcome sight, and the dark theme and blue stitching provide a sporty enough theme. Plus, the car benefits from the space of a hatchback. Want a car that can pick up a recliner from your mom then go fast on a racetrack? The Focus RS is the choice. When I hopped in to drive it, I immediately stalled it...twice, due to a hair-trigger clutch. I then drove it around on Chicago's pockmarked streets and found the ride to be a discouraging mix of bouncy and overly firm. The stiffly sprung car becomes especially bouncy over dips and humps at highway speeds. If anything on your body can jiggle, be it a Santa Claus gut or Buddha earlobes, it's going to jiggle when you are driving the Focus RS. The turbocharged 2.3-liter 4-cylinder also isn't all that efficient, either. My first 242 miles were spent mostly on the highway and I averaged a modest 21.4 mpg, according to the trip computer. Bouncy, harsh, inefficient, and with an old interior, I had come to the conclusion that the Focus RS isn't much of a daily driver after my first weekend behind the wheel. My opinion would soon evolve. It's not entirely fair to judge the Focus RS just on its manners in every day traffic. 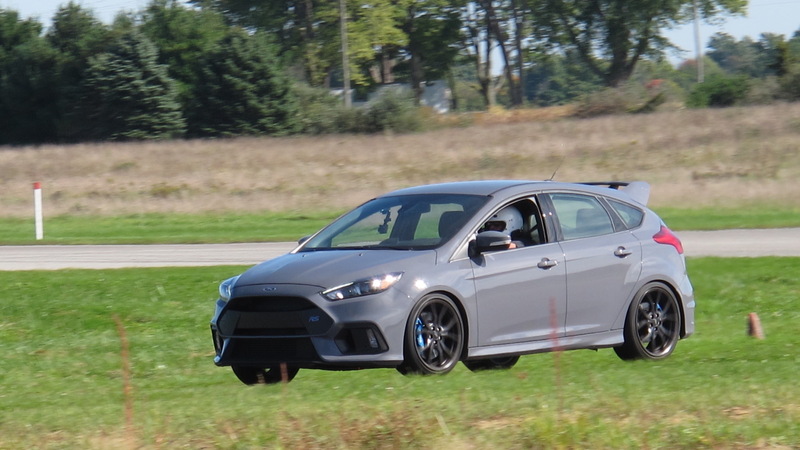 Luckily, that wasn't the end of my test drive and I had the opportunity to spend a day driving the RS on the 1.9-mile road course at Gingerman Raceway in western Michigan. As part of a CGI Motorsports Track Day, I drove the RS in six sessions that lasted up to 20 minutes each with a group of 10 or so other cars that included V-8 Camaros and Mustangs, Corvettes, a Porsche Boxster, a Focus ST, a Cadillac CTS-V wagon, and even a Porsche 911 GT3RS. The Focus RS was the surprise of the group. The morning began with low 50-degree temperatures. I choose the Track mode and headed out onto the track, being careful not to ask too much of the cold Cup 2s. As the tires warmed up, so did I, and I really started to fling the car around Gingerman. I soon learned that there is a benefit to the stiff suspension. Yes, the car leans a bit in corners, but not as much as you'd expect, and that lean provides great feedback. In fact, this car is all about feedback. You can use the sharp steering to toss the RS into a corner, inducing a bit of a slide, and at that point the car is putty in your hands. Turn in sharper to create a tighter radius and it just follows that arc, the rear end gladly following the front. Get back on the gas as the car is sliding, and it will start to understeer. This can be easily remedied by taking away a bit of steering angle, or letting off the gas. It's a fun dance, and it's easy to control exactly how the car will react. But that only gets us about halfway through the turn. If it's a tight corner, the all-wheel-drive system's torque vectoring rear differential helps the car rotate. The AWD system can send 70 percent of the available power to the rear, and the electronically operated dual-clutch torque vectoring system can funnel all of it to the outside rear wheel. As the corner starts to straighten out, you can get back on the power earlier than you can in a rear-drive car, and those four tires will scramble for traction, maintain your intended line, and power you out of the turn. In other words, pitch the car sideways, fine tune the steering and the gas to get you on the right path, then mash the throttle. That's a pretty boss way to take a turn. It made me feel like I was channeling my inner Ken Block, which is appropriate because he helped tune this car. The power is plenty willing, too. Floor it and the turbocharged 2.3-liter 4-cylinder shoves 23 pounds of boost down its own gullet. From a stop, the power doesn't hit you like a brick like you might find with a V-8, but it revs nicely and continues to build momentum up until its 6,500 rpm redline. At that point, you have to shift the tidy 6-speed to the next gear or, like any turbocharged engine, it falls flat on its face. Ford is quoting a 0 to 60 mph time of 4.7 seconds, and that should be possible for most of us to achieve given the all-wheel-drive system and the standard launch control feature. Ford has also programmed the exhaust to pop and crackle when you let off the gas, which really sounds cool. I'm most impressed by the fact that this thing can punch above its weight. I didn't have a VBOX in the car, but based on timing from the Go Pro I did have, I put up a 1:43.5 fast time at Gingerman. That compares to the 1:46.2 I posted last year in the Cadillac ATS-V. 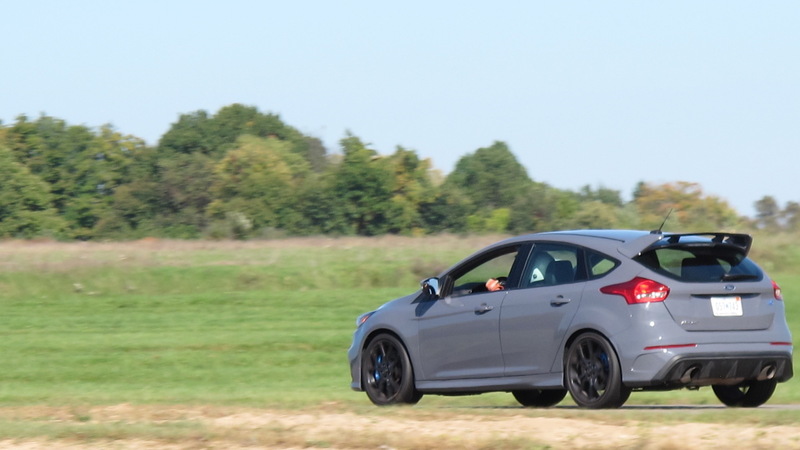 The Focus RS is faster around this somewhat tight track than a $65,000 coupe with 464 hp, this despite the fact that it is 10 mph slower in the longest straight. It also proved to be faster than a Mustang GT, a last-generation Camaro 1LE, and just about everything else that ran in my group at Gingerman. The only two cars I couldn't catch were a 2014 Camaro Z/28 and a 2016 Porsche 911 GT3. 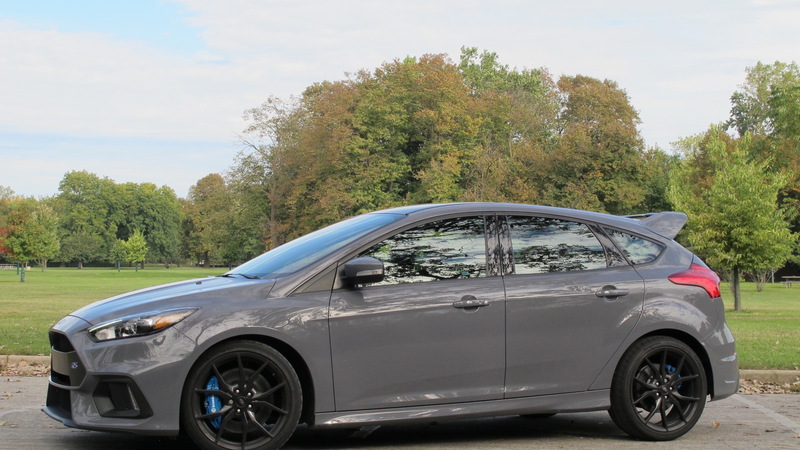 For the most part, the Focus RS held up well through six sessions ranging from 15-20 minutes each. The Brembo brakes never faded, and the engine and transmission temperatures remained in the safe zone. However, about 13 minutes into the final session, a message popped up in the instrument cluster saying that the car was now FWD only. By then temperatures had topped 70 degrees and the car had been out on the track for a good hour and a half. That proved to be enough to overheat the rear differential. A lap and a half of taking it easy to cool it down restored the AWD, but this is something buyers who intend to track their cars should monitor. The other minor issue was with the trip computer. Driving hard on a track reduced the car's fuel economy to 8.6 mpg and that included about 125 miles of highway driving. On two occasions I went out onto the track with a half-tank of fuel left, then watched the fuel gauge drop from half full to empty while the trip computer first flashed 50 miles of range remaining then 0 miles left within about one lap of driving. On the way home, I filled up again, but the computer flashed a warning that only 50 miles of range were left after only 120 miles of highway driving (the RS has more than 250 miles of range on a full tank). I think my aggressive track driving confused the computer, making it think I was going to rail on the car again. I suspect it will straighten itself out after a few tankfuls free of track time. Those minor issues aside, the Ford Focus RS is a genuine track athlete. It inspires confidence in the driver because it provides so much grip and when it does lose traction it does so in a controlled manner that is easy to rein back in. For fans of the STI or Evo who have wanted more from those cars for years, the Focus RS is the next evolution in the story of the hot hatch. It may not be all that fun on city streets but when the tarmac turns twisty, it's a hot hatch that can best V-8 sport coupes.